It's still quite hot here in the Midwest, so hot that going outside (unless we are in a pool) is unbearable. But leaving the TV on all day is mind-numbing and makes us all grouchy. Thank God for rice sensory bins! 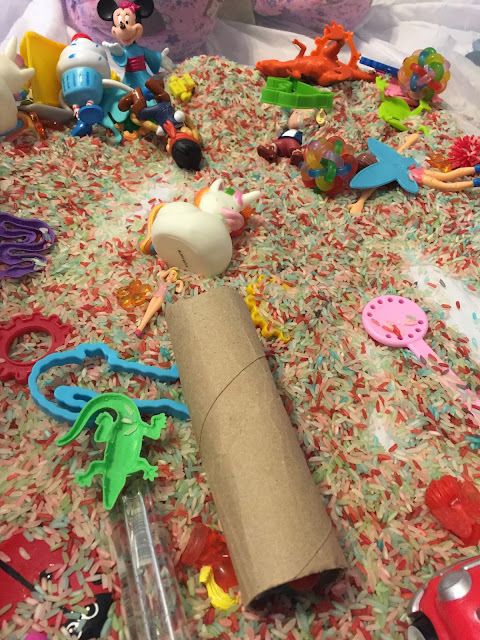 They provide sensory play that is both calming and engaging. They smell so good which is great for your kiddos who like to sniff. They are an awesome catch-all for those random trinket-junky toys you get at birthday and school parties, hand-outs from the bank, leftovers from Halloween and Christmas stockings, toys from kids' meals, and pieces from toy sets that are no longer complete. With a four-sided bin, up to four kids can play in a bin at any given time. (You can make the bins as large or as small as you choose depending on how much space and how many kids you have. They keep the kids occupied while you try to accomplish a thing or two. The rice is easy to clean up. If you play on a hard floor, just sweep up any spillage. If you have your kids play on carpet, vacuum up the spilled rice. We also play it outside on our screened-in porch or even on a sidewalk. The bins are easy to store, and the rice stays good for a long, long time. You can customize the bins to fit your kids' likes and favorite scents and colors. You can spend as much or as little as you like on the bins. The most expensive part is the bin itself, because the more long and shallow bins (think "under bed" bins) that have secure lids can be pricey. The rice and Kool-Aid is inexpensive. The bins are great to pull out during rainy, too cold, or too hot days. They might be used on sick days, too...but don't plan on being able to sanitize all those tiny toys (or the rice---ha!) when the play is done. A bin with a lid that fits on securely. Carefully select your bin, considering the size (depth and length and width). Make sure you have a designated place to put the bin. An old sheet to go under the bin (it makes clean up easier and you don't waste as much rice. After the kids are done, pour the rice from the sheet back into the bin). White rice, Kool-Aid packets, and rubbing alcohol. Plus you need cookie sheets and foil and something to stir the rice with. The recipe I used to make rice can be found here. A NOTE ABOUT THE KOOL-AID: As a non Kool-Aid drinking family, we realized that the flavor listed on the packet doesn't always "match" what you would think the color of the powder will be. If you want to go for scent, choose the scents your kids like. But if you're going with a theme (like we did with our ocean-themed bin) where you are aiming for specific rice colors (blues, purples, greens), you need to test out the Kool-Aid packets first. Some of the Kool-Aid packets we bought offered SUCH light colors that it was hardly worth coloring the rice with them. Items for the bin. I prefer a variety of textures, sizes, and purposes. Also decide if you want a themed bin (like our ocean-themed bin) or a hodge-podge bin for all those random toys I talked about above. I get measuring spoons as "shovels" at the dollar store. Have your children help you pick out the Kool-Aid packets and stir the rice as it's drying (see recipe above). Have your kids find items for the bin: think leftover pieces from toy sets, small toys from birthday parties, even items from the recycle bin (like the toilet paper cardboard---used as funnels), small plastic figurines, bouncy balls, small toy cars, rubber duckies, leftover PlayDoh set toys, etc. 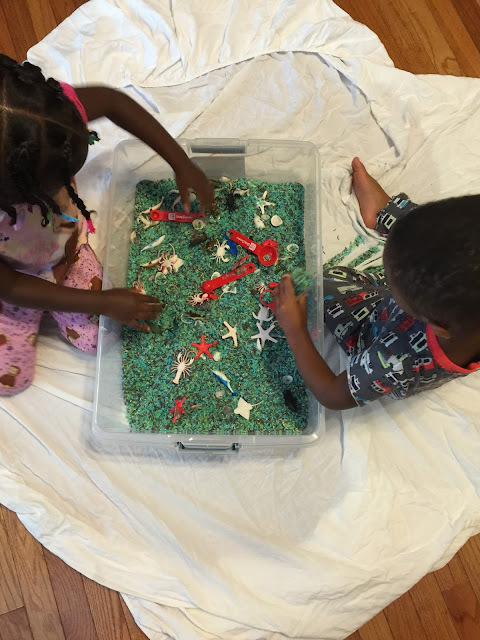 Have your kids help you scour stores to find items for a themed bin (like our ocean-themed bin. The figurines came from a set at Target which was $8; the red measuring spoons were from our dollar store; we added small seashells from a beach vacation). Set a budget, and talk about calculating your items as you shop to stay within the budget. Have your kids save their money to add items to their rice bins. Create rice bins as gifts for birthday parties or Christmas exchanges. At minimum, you could gift colored rice and instructions on creating their own sensory bin. Create holiday or season themed sensory bins: Halloween (black/orange), Fall (red, orange, yellow), Christmas (red/green), Valentine's Day (red/pink), Winter (blue/white), Spring (pastels), Fourth of July (red/white/blue), etc. Choose a theme by browsing the figurine sets at a local store. The dollar section at Target is a great place to start! 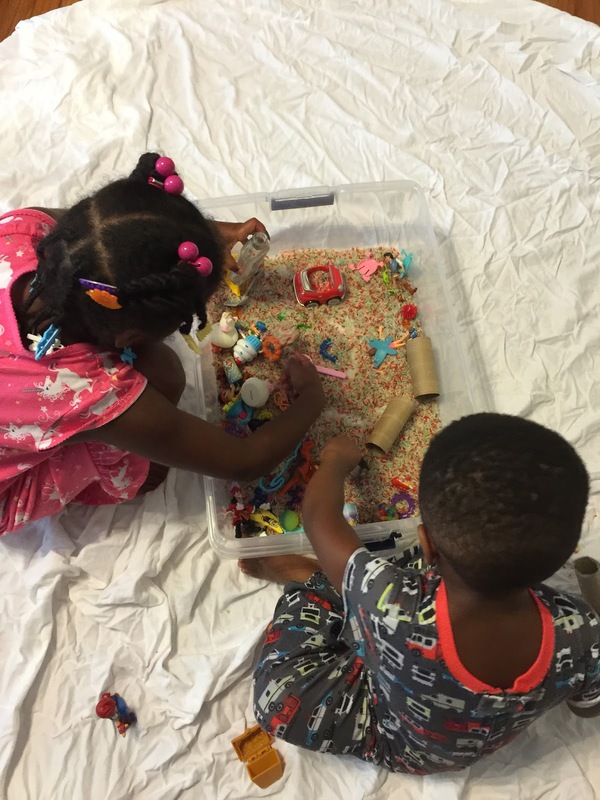 To learn more about the importance of sensory play, check out the final chapter of my new book Homeschooling Your Young Black Child: A Simple Getting-Started Guide and Workbook.